See below for a full product description. Divorce can be emotionally devastating at any time, but the emotional and financial challenges are even greater for those who divorce later in life, with complicated issues of blended families, health care concerns, and retirement planning. The book also includes divorce survival stories that illustrate your options and provide encouragement. They got through it, and with the help of Divorce After 50, you can, too. Janice L. Green is a family law attorney who has practiced in Austin, Texas, for more than 30 years, the last 26 as a partner in the AV-rated boutique family law firm, Farris & Green. She is Board Certified in Family Law by the Texas Board of Legal Specialization, a Fellow in the American Academy of Matrimonial Lawyers, named to Best Lawyers in America, and a Texas Monthly Super Lawyer. She is a frequent lecturer and published author of more than 40 articles on family law. Green is an Honors graduate of the University of Texas School of Law and Phi Beta Kappa graduate of the University of Texas. While continuing to reside in Austin, she makes time to escape to her cabin-home outside Pagosa Springs, Colorado, to garden, write, and relish mountain sunsets. Starting in middle age and even more strongly in our later years, most of us plan to pull our foot off the accelerator and begin to coast on the fruits of our lifelong efforts—in the best-case scenario, settling in to a pleasant retirement or semiretirement. It can be shocking and confusing to have this expectation turned upside down by a divorce—even if you’re the one initiating the split. You may be wondering why this is happening when you feel you are in the prime of your life and have finally reached the moment you have been waiting and working for. What you’re learning is that age does not provide immunity from divorce, nor does a long-term marriage protect you. According to Pew Research Center, about 34% of those divorcing after 50 have been married at least 30 years and 12% for over 40 years. You may be reading this book because you’ve recently had the shock of hearing from your spouse that a divorce is in the wind. You may be the one who wants the divorce. It’s also possible that you are considering divorce but need to gather more information before making a final decision. No matter what your situation is, you are probably feeling anxiety and a sense of isolation, along with a desire to understand what is happening—and why. Late-life divorces and long-term separations can happen for the same reasons as the relationship breaches of younger adults: infidelity, family violence, substance abuse, financial pressures, regrets about earlier decisions, or the desire for independence. However, many of these reasons are reframed and have new meaning when they surface in the context of a graying divorce—and some late-life divorces are the result of realities unique to older adults. Reflecting on the “why” may be your first step in this difficult process. It can help you make decisions in the near term and may shape your negotiation strategies later. More important, understanding why and knowing that others have come before you with the same concerns, issues, and feelings can help you feel less isolated and confused. 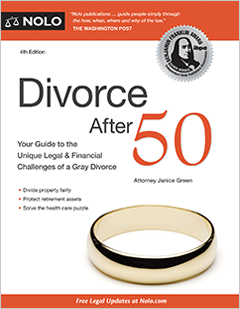 This chapter covers some of the most common answers to the question I ask new clients: “What brings you to my office?” The answers provide insight into some of the most common circumstances underlying the graying divorce. Aging can play a significant role in a decision to divorce later in life. Along with the reality that we are all living longer, our “can-do” culture offers incentives to tackle challenges at any age. An emphasis on individual fulfillment sometimes seems to encourage the idea that we can achieve happiness at any age if only we follow our hearts, even if that means switching partners after many years. A person staring at a 60th birthday may choose to end an unhappy marriage and make a fresh start, stepping out of marital turmoil to seek happiness and live a life that feels more authentic. With modern medical advances, it’s easy to believe there will soon be a cure for many of the conditions that accompany aging. Thanks to advertisements for the latest and greatest pharmaceuticals and medical procedures, we begin to think that high blood pressure, diabetes, heart conditions, cancer, and other debilitating diseases will gradually cease to exist. We are inundated by reminders that we will live longer if only we stop this bad habit, start taking that vitamin supplement, or embark on a new exercise regime. We also hear that if we laugh more often, keep positive thoughts in the forefront of our minds, and reduce stress, marital happiness and good health will follow. If it looks like divorce will help generate these elements in one’s life, then it’s not a big leap to the idea that divorce will lead to a longer and happier life. There’s even some scientific support for this idea. An American Medical Association study involving 42 married couples found that hostile marriage partners take longer to heal from physical wounds, such as surgical incisions, than nonhostile couples. (The hostile behaviors that were measured included belligerence, glowering, threatening speech, hostile tone of voice, criticism, and dramatic eyerolling.) This study involved a relatively small number of subjects, but its conclusions mirror findings in earlier research that show troubled marriages contributing to depression, heart disease, and even death. All of these realities can act as motivation to seek what appears to be a healthier lifestyle on the other side of a divorce. When a married spouse becomes ill, society’s expectation is that the healthy partner will adhere to the traditional wedding vow to stick around “in sickness and in health.” But serious illness can change things in a marriage. For example, when a spouse becomes seriously ill, and especially when an ailing spouse is cognitively impaired or doesn’t recognize the healthy spouse (for example, with Alzheimer’s disease or a severe brain injury), things can shift drastically. The healthy spouse in an unhappy marriage can experience the illness as the last straw. Spousal abandonment after a diagnosis of cancer or multiple sclerosis was the subject of a joint research study by the University of Utah and University of Washington Schools of Medicine. They found that a woman is six times more likely to be separated or divorced soon after she receives such a diagnosis than if a man is the patient. Even spouses who aren’t alienated from their partners consider divorce when cognitive issues prevent them from having a satisfying marital relationship. These situations are loaded with abandonment issues, but many spouses come to believe that the ailing spouse would have supported the idea of divorce under the circumstances. Some spouses divorce in name only while continuing to live together, in an effort to preserve marital assets. This isn’t about greed, but about protecting Medicaid or other crucial benefits. The fear of depleting a marital estate when serious illness strikes is real—nearly half of U.S. bankruptcy filings list medical bills as the reason for seeking relief, and 80% of those are people who had some form of medical insurance. Social science research is clear that spouses must make emotional adjustments when a partner retires or children leave home for college or to begin their own adult lives. Much has been written about the “empty nest” syndrome and the sound of silence that accompanies it when parents have nothing to say to each other because substantive communication has always been tied to their children. The children are gone, interests once fed by the workplace vanish, friends move away, and a couple is without common purpose. Some parents who always lacked common purpose but resisted divorce because of their children give themselves permission to divorce when the children reach adulthood. Retirement can also have enormous impact: A retired husband may demand the same mothering as a long-departed child, and his wife may be reluctant to take on another full-time caretaker role. Older men, too, may flee a marriage when they feel inadequate to handle the closer proximity of a needy or dependent wife after retirement. This bleak picture isn’t the only possible outcome—many spouses return to interests shared earlier in life, like travel; and many develop new common interests and projects. But problems can arise, and even lead all the way to divorce, when one spouse blames the other spouse for late-life tedium and decides to end the marriage instead of searching for new ways to relate. Divorce filings driven by a lack of common purpose frequently come as a surprise to the abandoned spouse, who soon learns how many complaints have been stored in the other’s memory bank. When the loss of purpose drives a divorce, it is often coupled with another reason, such as recognizing one’s own mortality or discovering (or rediscovering) a romantic connection outside the marriage. Infidelity may be a cause of divorce in itself, or it may be symptomatic of another problem in the marriage. A late-life divorce is no exception. Research tells us that sexual drive does not stop at some predetermined age: A 2001 survey of 1,300 Americans over the age of 60 found that nearly half reported having sexual relations at least once a month, and 40% of those wanted to have relations more often. The first comprehensive national survey of sexual attitudes, published in 2007, concluded that most active people ages 57 to 85 experience only a slight decline in the frequency of sexual activity from the 50s to early 70s, and that many men and women remain sexually active well into their 70s and 80s. When intimacy with a spouse has been dormant, it is not unusual for desire to start clamoring for expression outside the marriage. Class reunions, Internet chat rooms, and social media are prime arenas for that expression. There’s no data on the frequency of infidelity in the lives of older adults, but we do know that lack of sexual relations is reported frequently by older spouses as the reason for wanting to leave the marriage (or the justification for an affair). In my view, the power of sexuality—and the corresponding fear of losing it—can cause people to act in ways that seem surprising from an outsider’s view. Time and again, I see older clients who are ready to walk away from a long-term marriage because of an affair or new relationship (or the corresponding client who is shocked to discover a spouse’s affair). As these cases progress, extramarital acting out is often explained by revelations of weak or nonexistent common interests, problems with communication, or health conditions interfering with sexual relations. If an older divorce client in a long-term marriage is experiencing a marital crisis sparked by a single act of infidelity (rather than a pattern in the marriage), there may be merit to waiting or stretching out the divorce process to give the spouses time to work through the impact of the event. I have seen many such situations that ended in reconciliation, with the infidelity serving as a wake-up call rather than a death knell. Just as every divorcing spouse is responding to conditions within that person’s own marriage, nearly everyone is also driven by social forces. This can be particularly true for a spouse divorcing later in life after living through significant cultural transformations. Gender Equality. It’s my opinion that greater gender equality in recent decades, both in the workplace and in the home, has contributed to many graying divorces. The increase in opportunities outside the home has led women to seek fulfillment and independence later in life and to reject the traditional woman’s role of caretaker, especially once children are grown and gone from home. As more women establish successful careers, they also create their own sources of retirement income, removing a barrier to divorce. Women who remain more financially dependent on husbands may be slower to initiate a divorce. Economic Climate. Economic conditions affect the timing of divorce, too. During short-term economic downturns, spouses sometimes put divorce on the back burner. During longer downturns, divorce can be perceived as a remedy to ease financial stressors—or can be rendered impossible by the reality that there’s simply not enough money to get divorced. This is especially true when the economic outlook includes a poor real estate market, rendering a couple’s most valuable asset less flexible. No-Fault Divorce. A no-fault divorce requires only one spouse believing that the marriage is broken and irreconcilable. No-fault laws do not require proof of cruelty, infidelity, or abandonment, the traditional grounds for divorce. The growth of no-fault laws in the 1970s—a reflection of society’s changing attitudes toward divorce—gradually made divorce less stigmatizing, as the increasing divorce rate has done as well. This social change can have an effect on older spouses, who see acceptance of divorce around them. And if an older adult’s grown child gets divorced, the parent may look differently at marital disharmony and see divorce as a real possibility. No-fault divorce is now available in every state in the United States. Spousal Abuse and Substance Abuse. A study by the American Association of Retired Persons (AARP) cites verbal, emotional, and physical abuse as a primary reason for divorces in couples between 40 and 79 years of age. More than 20% of the 1,147 men and women surveyed cited drug or alcohol abuse as a major cause of the divorce. Substance abuse often goes hand in hand with physical and emotional abuse. Despite increased public awareness of the prevalence of spousal abuse and the development of better intervention and prevention services, it is not easy to shake off entrenched aggressor-victim roles that have been played out for decades in a long-term marriage. It takes tremendous courage to break this abusive cycle later in life. These are some of the most difficult cases to see to completion because frequently an abused partner abandons the process and returns to the familiar. Nevertheless, my experience is that more and more long-term victims are deciding to stop the abuse. Divorced persons tend to remarry—and, statistically, to divorce again. About two-thirds of divorced women and 75% of divorced men give marriage another try. And those who have divorced before appear to be less willing to stay in an unhappy marriage—the divorce rate for second and subsequent remarriages is higher than for first-time divorce—60% or more. Of people over age 50 who divorce, 53% have divorced at least once before. For those aged 50 to 64, having been previously married doubles the risk of divorce; for those 65 and older, the risk quadruples. According to the anecdotal observations of family law attorneys, there are two typical repeat customers among older divorce clients. The first is the older adult who has the financial means to marry and divorce repeatedly. The second is the client who remarried within the first few years after a previous divorce. Psychologists describe the two years following a divorce as a crisis period during which the divorced person experiences intense emotional upheaval, continuing conflict among family members, and difficulty adjusting to a new lifestyle. When in the throes of such turmoil, it is natural to seek solace in a new relationship. Unfortunately, the solace is often short-lived. Again anecdotally, this pattern seems to affect men more than women. With the clock ticking loudly, men seem eager to extricate themselves from struggles on the home front so that they can move quickly into new relationships that they expect to be more peaceful. Women, on the other hand, seem more adept at creating postdivorce support systems instead of remarrying quickly: circles of friends, formal counseling groups, and involvement with family members, particularly grandchildren. We all know people who have remarried too soon after losing a spouse, when the grief and loneliness felt too great to face alone. Remarriage is a way to end isolation and loneliness—but it can be unwise if it’s too soon after the loss. The grief process from the first marriage—whether it ended in death or divorce—must run its course. The death of a parent can also be a motivating loss precipitating divorce. What had served as a buffer between self and death is removed when a parent dies—thus it is yet another opportunity to confront one’s mortality and open the door to contemplating divorce. The death of a parent can also be a trigger if the parent’s approval was important: When that parent was alive, the adult child—even an older adult—may have rejected the idea of divorce because it would draw the parent’s disapproval and judgment. When the parent dies, the option of divorce becomes more real. Finally, there is the loss of youth and health. Try as we might to surgically lift our sagging parts and tuck our folds away, age catches up with us. Youthful appearances start to recede, and unhappy spouses begin to look anywhere and everywhere to recapture them, blaming the loss of youth on an unsatisfactory marriage and assuming that good times will roll again if the marriage ends. Have you found elements of your own story here? There is often overlap, sometimes a great deal, among these themes in the late-life divorce; rarely does a marriage fall apart due to a single cause. Any divorce has the potential to create feelings of bitterness, self-righteousness, and victimization. This is normal, and especially likely in a late-life divorce, where the very length of the marriage can give rise to an intense sense of betrayal. You will need time to work through these feelings, but work through them you must. If you don’t, they will make your inner life more difficult and painful for a longer time. They’ll also stand in the way of your divorce process. Bitterness interferes with sound judgment and makes it harder for others to listen to what you have to say during negotiations. And many judges discount the testimony of a bitter and angry witness. This is not to say that finding your way out of bitterness is easy; you may well need help. Consider reading some of the excellent books available, either on divorce specifically, on grief or loss, or simply about handling life in general. Join a divorce support group, or start or resume counseling. Make sure you keep up your friendships with the people who really support you, and take good care of your physical health. In other words, try any and every constructive avenue that will help you be calm and focused as you ride the emotional and legal rollercoaster of divorce.